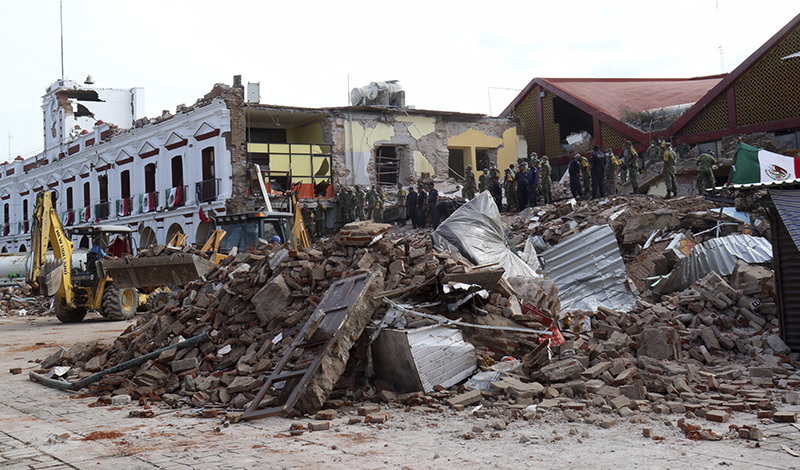 The quake was so strong that it caused buildings to sway violently in Mexico's capital more than 650 miles away. Reports say 26 people are dead. MEXICO CITY — One of the most powerful earthquakes ever recorded in Mexico struck off the country’s southern coast, toppling hundreds of buildings, triggering tsunami evacuations and sending panicked people fleeing into the streets in the middle of the night. At least 35 people were reported killed. The quake that hit minutes before midnight Thursday was strong enough to cause buildings to sway violently in the capital city more than 650 miles away. As beds banged against walls, people still wearing pajamas ran out of their homes and gathered in frightened groups. The earthquake hit off of Chiapas’s Pacific coast, near the Guatemalan border with a magnitude of 8.1 — equal to Mexico’s strongest of the past century. It was slightly stronger than the 1985 quake, the U.S. Geological Survey said. 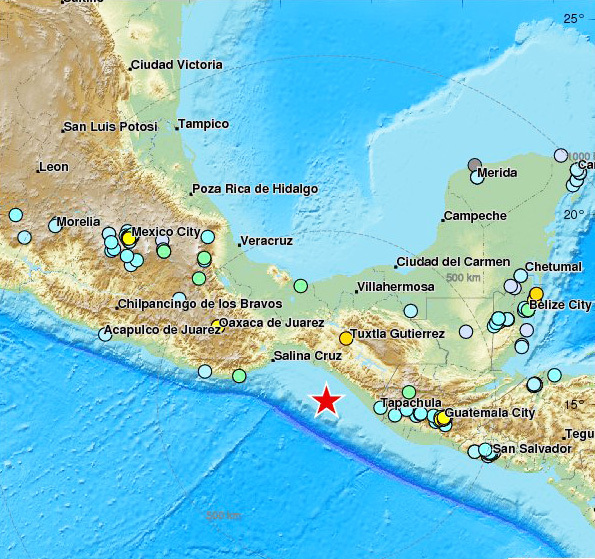 The quake struck at 11:49 p.m. Thursday , and its epicenter was 102 miles west of Tapachula in Chiapas. It had a depth of 43.3 miles, the USGS said. The Pacific Tsunami Warning Center said waves of 3.3 feet above the tide level were measured off Salina Cruz, Mexico. Smaller tsunami waves were observed on the coast or measured by ocean gauges elsewhere. The center’s forecast said Ecuador, El Salvador and Guatemala could see waves of a meter or less. No threat was posed to Hawaii or the western and South Pacific. The new quake matched the force of a magnitude 8.1 quake that hit the country on June 3, 1932, roughly 300 miles west of Mexico City. A study by the seismological service concluded that that quake killed about 400 people and caused severe damage around the port of Manzanillo. A powerful aftershock that hit 19 days later caused a tsunami that devastated 15 miles of coastline, killing 75 people.